Estimates of current fiscal stress are based on numbers in the annual financial reports (Annual Update Documents or AUD), which are used to calculate component factors such as fund balance, operating deficit, cash position, short-term debt, personnel costs, and debt service. Estimates of future susceptibility to stress are based on trends in population, age distribution, poverty rates, property values, employment base, state/federal aid, tax limits, and sales tax. Both rate the stress on a scale from zero to one hundred, with zero being the least stress. OSC initiated their FSMS in 2013 with ratings calculated from the 2012 financials. Ratings have been revised annually for 2013, 2014, and 2015. Calculating ratings for 2,300 governments and schools requires months after the May 1st deadline for the submission of financial reports. Ratings for 2016 should be released shortly. The Ash Center for Democratic Governance and Innovation (Harvard Kennedy School) recognized this FSMS as one of the twenty-five top programs for Innovations in American Government Awards in 2017. At right, the table shows these ratings for the nineteen towns in Delaware County for 2015. In both categories, the towns with the least stress have their ratings in italics. 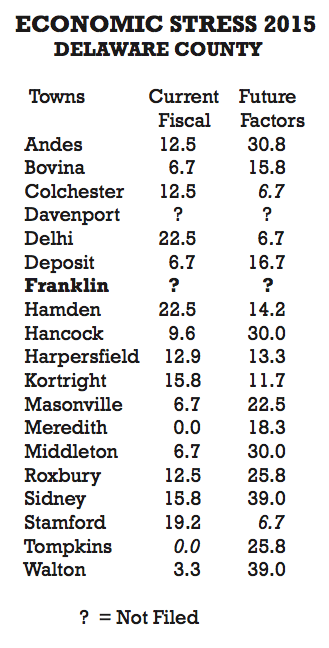 Even the relatively high ratings of current stress for neighboring towns of Delhi and Hamden (22.5) are well below what OSC considers a “susceptible” level of stress at 45 to 55. A nearby example of a susceptible level of stress in 2015 is the City of Norwich at 45.8. Higher levels of stress are moderate at 55 to 65 (Town of Cherry Valley, 63.8) and significant at 65 to 100 (Broome County, 67.5). By contrast, Delaware County is rated 12.9. For eight years in a row, our town government has violated New York General Municipal Law (Section 30) by not filing AUDs with the OSC, as documented by the OSC in their Report of Examination, Town of Franklin, Financial Operations, Report 2014M-32. The boards of the towns of Davenport and Franklin refuse to release the required end-of-year accounting, thereby deflecting examination of the fiscal stress levels of their management. Annually, OSC designates both towns as “not filed.” In the OSC progress report on the first three years of their FSMS, Davenport and Franklin are listed in the Appendix of Persistent Non-Filers, two of only 28 among the 932 towns in New York. In contrast, all other towns in Delaware County filed AUDs and have no designation for stress. In May, a warning letter sent from the OSC to Supervisor Taggart cautioned that these stress ratings are consulted by state legislators, oversight agencies, and credit ratings services, among others. Our town board is considering building a town hall adjacent to the town garages, which would require taking on debt. Any bank would consult credit ratings before setting the terms of a loan. Without AUDs, towns can not be certified as “fiscally eligible” by state agencies such as the newly established Financial Restructuring Board for Local Governments. Franklin could be considered ineligible for grants to defray the costs of building a town hall. A final note: Indifference to the law by our town government could increase the cost of a new town hall, with those costs to be borne by Franklin taxpayers.